It's hard for me to believe my sweet boy is three years old. What a journey we've been on. What a blessing you are to your family and to so many other people! I love you more each and every day. You are an inspiration to me. You are a wonderful boy who is very smart, very funny, very sweet and very loving. As I sit here and think of you and your life I am so grateful to be your mommy. I have learned so much in these three years. I have learned I can do a lot of things I didn't think I could do. I have learned that the Body of Christ in action is a beautiful thing. I have learned that life is precious and should not be taken for granted. I have learned that you are truly a gift from the Lord and He trust me to be your mommy! I pray that your day is filled with love, family and lots of fun! I love you best, I love you most, I love you high, I love you low, I love you deep, I love you wide, I love you THIS MUCH! 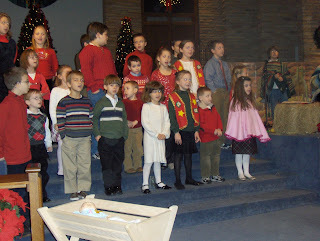 This morning Maddie and all her friends at church put on their annual Christmas program. Maddie had about four lines and remembered each one and said them when she was supposed too! We were really proud of her! 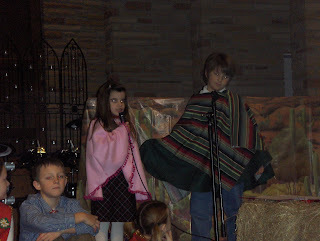 Maddie played a girl named Maria and her first line was 'Hola, Pablo!' It was pretty hysterical! She wore a pink fleece poncho (with lots of static electricity!) 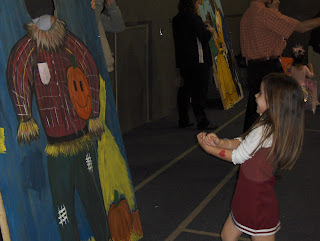 I think the poncho was her favorite part of the whole process! The director of the play very graciously let Maddie have the poncho, she wanted to sleep in it today during her nap! Okay, so it's time for a more upbeat post! Christmas is just around the corner and we are getting ready. I finished my shopping today! Boy does that feel great! Just a few more packages to wrap and stockings to stuff and we'll be all ready. 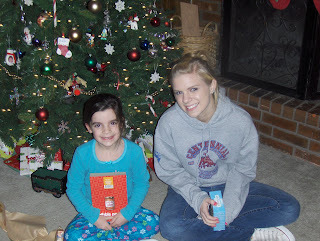 Kayleigh's grandparents and her Aunt Jackie put together Twelve Days of Christmas for us. We started opening presents on December 13th and we will get to open one gift each night until Christmas Eve. Can you imagine the thought and preparation that went into making this happen for our family? Monna, Pops and Aunt Jackie are so thoughtful and we're so grateful to them for helping us make time each evening to spend with each other! 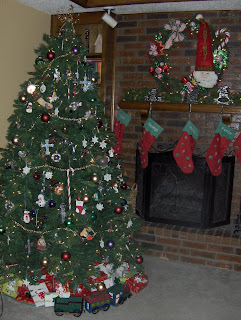 I have several blog friends who have posted pictures of their Christmas trees so I thought I'd like to do the same thing. 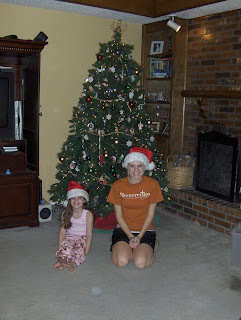 Last year I found a seven and a half foot pre-lit tree on clearance for forty bucks! It is gorgeous. It was fast and easy to put up, too! Growing up my family always had a 'real' tree. After Craig and I were married we purchased a fake tree, much to my chagrin. But I quickly fell in love with that tree when I didn't have to water it, vacuum dead needles, and received NO bloody scratches upon taking it down! I'll never go back to the real thing! I have slowly converted a few of my sisters to go the 'fake' route also. I believe they're convinced! We are planning to bring Fletcher home on Christmas Eve for an overnight stay. We're very excited to have him for a whole night. 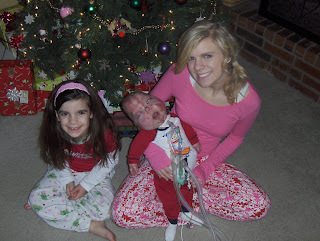 I can't think of anything I'd love more than to have all three of my children waking up in our home on Christmas morning! Well, I've been putting off posting about this for nearly three weeks. I am still struggling with the results of Fletcher's MRI and I am really not sure that I understand what's happening to my sweet boy. It's one of the main reasons I stopped to blog about the Lord's faithfulness because I needed to remind myself of all that He's done for Fletcher thus far. 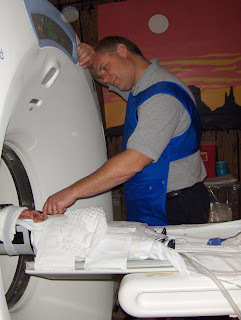 One of the first things that the MRI showed is that Fletcher has bone overgrowth in his skull. The overgrowth has 'obliterated his para nasal sinuses', now we know why his nose runs constantly. They are worried now about his optic nerves and his ears wondering if the bone growth will cause hearing and sight problems. They do not know when or if the bone growth will stop. And the hardest news of all...the MRI also showed that Fletcher's brain has atrophied. I just don't get it. I have just recently let my guard down about my dreams for Fletcher's life. He is tolerating (very well) the weaning of steroids, methadone and valium. I honestly thought our next big thing would be conquering the ventilator, knowing that could take years, but that was okay with me. But now, his future is uncertain. I guess it really always has been just like mine and yours. Two weeks ago we went to the dermatologist, he's one of the few doctors Fletcher has that knows anything about Epidermal Nevus Syndrome (ENS). When he was reading the MRI report he told us that all this goes hand in hand with ENS and so does the phosphorus problems. Wherever the nevus is the overgrowth of bone can happen, well most of the nevus is on sweet Fletcher's head, thus the misshape of his head. Also they believe his eyes are protruding because of the bone growth. At this point, no one really knows what to do, so they are researching and educating themselves on ENS. We are working with Fletcher's endocrinologist to help get his electrolytes back to normal. The dermatologist is seeking the advice of one of his colleagues to find out how we can help Fletcher and maybe have some kind of idea of what to expect. We are also waiting for a meeting with the neurologist to see what he has to offer. As I'm sure you can imagine my heart is breaking. I'm struggling with how to pray. Do I pray asking the Lord to stop the over growth of bone? I know He can do anything, but will He? I'm afraid to ask. I'm afraid to pray for His perfect will, because I'm afraid it won't be what I want for Fletcher. I keep having these conversations with myself. Telling myself that perfect love cast out all fear, telling myself that His ways are higher than my ways, telling myself not my will but Your will be done. But still I'm afraid. I'm afraid of what the future holds for Fletcher. 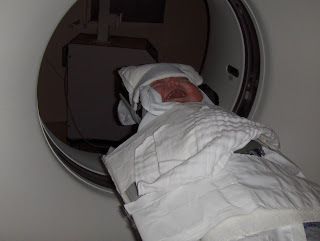 When they gave me the news about the MRI I said to myself, 'this is the worst news EVER!' Then I reminded myself that the worst news ever would be Fletcher not being here with me. Please pray for Fletcher and for Craig and me. We've decided to just enjoy Fletcher and take each day as it comes. That's all we can do for now. He's such a sweet boy. Today I took a few pictures of him while he slept. Craig also took a picture of him playing tonight. Yesterday afternoon Fletcher was in a Christmas program at TCC. He seemed to enjoy himself and the program was really cute. His little group played the drums. 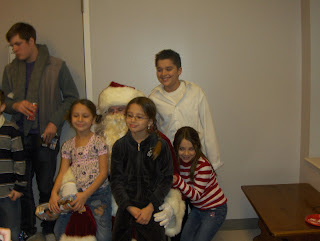 Kayleigh, Maddie and their cousins Devon, Megan and EmiLee also came to see Fletcher's performance. Right before the program as I was waiting with Fletcher a camera crew kept filming him interacting with us. A few minutes later a woman introduced herslf to me. She works for OETA, which is our local PBS station, she is working on a documentary about Music Therapy and she wants to follow Fletcher through his therapy. Well, he loves music and he loves Friday's because that's music day in his classroom! So, I agreed to let him be a part of the documentary. I don't really know what that means yet, but I'll keep you posted. I can’t continue to tell this story without pausing to reflect on all the amazing things the Lord was doing for us during these times. God has provided for us each step of the way. Besides giving us the privilege to be Fletcher’s parents, He provided us with family, friends and an amazing church family. I want to take this time to tell you the ways the Lord provided for us and showed Himself in ways that seemed impossible to us. You know when you’re in the hospital you have to pay a co-pay and a deductible? Well, our sweet church took up an offering for our family and raised $3000.00, which was the exact amount of money we needed to pay Fletcher’s bill and mine! One day I went out to check the mail and I found an unsigned card with five one hundred dollar bills in it! The church Craig’s parents attend wanted to do something for our family so they had a car wash and garage sale. They raised $800.00! During Fletcher’s first summer the air conditioner in our house kept breaking down and a friend at church who owns a heating and air conditioning company sent one of his guys to our house to repair it every time it broke down. At no cost to us! Remember the home health VP who helped us tremendously? Well, before he helped us, friends and family heard how much it was going to cost and we received three or four checks, each for the amount of $350.00! One of my best friends, Laurel wanted to do something worthwhile for our family so she organized two months worth of meals, babysitting, hang out time for my girls, and errand running! One of my other girlfriends had my house cleaned twice a month for at least 8 months! 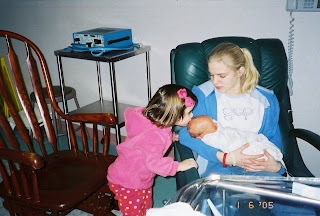 We had two scholarships to two different Mother’s Day Out programs for Maddie, allowing me to be with Fletcher each time he was in the hospital. 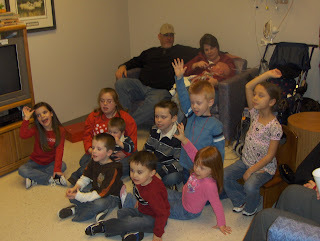 Many of my friends would come and sit with Fletcher in the hospital so I could do other things. 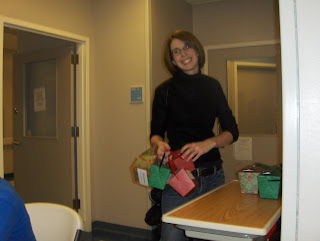 In August of 2005 my sister Dawn organized a 24-hour prayer vigil it was such a blessing to know people were praying. During the spring of 2006 our air conditioner broke again, I called our friend from church, he sent someone out to fix it and decided we needed a NEW heater and air conditioner. Do you know what he did? He GAVE us a brand new system for free! WOW! That one still amazes me! I could sit here for hours and tell you of the wonderful things the Lord has done for us and is still doing for us. What a blessing to see the Body of Christ in action. We met with many doctors while Fletcher was in the hospital. One doctor in particular was Dr. Morris a GI doctor he recommended that Fletcher have a g-tube placed in his tummy so he could get the nutrition he needed and a procedure called a fundoplication this would help with any reflux problems. 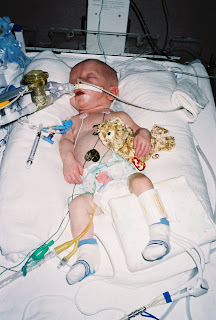 I remember thinking that a feeding tube would be the end of the world! Craig and I prayed and were prayed for and we agreed that this was what Fletcher needed. We wanted the best for him. 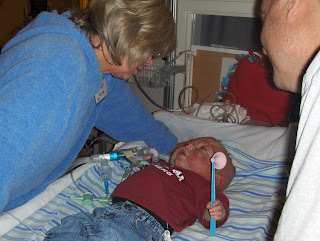 Fletcher had his feeding tube and the fundoplication on May 2, 2005. Everything went well, the nurses tried to keep him as comfortable as possible without making him too dependent on the ventilator. 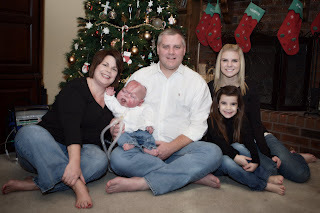 His lungs were clearing and we hoped he'd be off the ventilator soon. He also had the MRI while he was in the hospital and it came back normal! Praise the Lord! Boy, were we thankful for such great news. 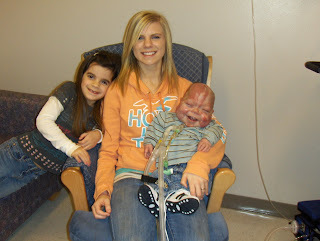 They also tested him for cystic fibrosis. And it came back negative. 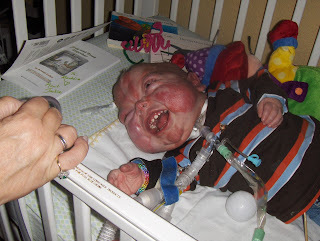 This little boy baffled the PICU doctors. 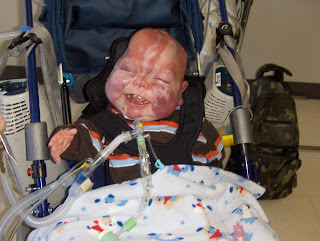 They didn’t know a lot about the Nevus (his skin condition) so they weren’t sure why he was having feeding issues and needing the vent. 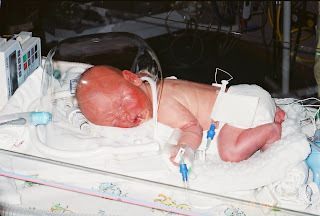 Anyway after thirteen days on the vent they extubated Fletcher and we were finally able to hold him again. After 48 hours we went to the regular pediatric floor for three days. 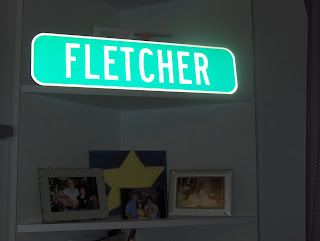 On May 8, 2005, Mother’s Day, after 18 days in the hospital Fletcher was discharged. 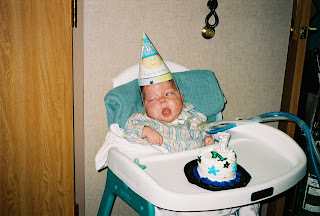 We now had a way to feed him and the hope was that he would gain weight and catch up on the milestones he had missed. We also would have a home health nurse coming to our home 3 times a week. We went home hopeful. As soon as we got home we changed pediatricians. We had our first appointment with Dr. Albiek on June 1, 2005 he was caring and compassionate we knew we had the right doctor this time. Fletcher seemed to be doing well at home. He was gaining some weight and weighed around 10 pounds. 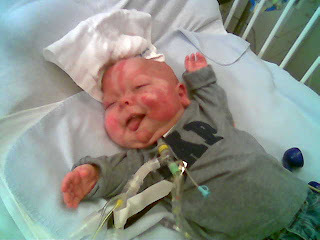 On June 8, 2005 Fletcher was having a really tough day and our home health nurse Kristi, suggested that Craig and I take Fletcher to the ER. 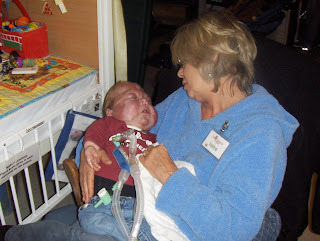 Sure enough he had pneumonia and was intubated and on the ventilator again. Dr. Albiek met us in the PICU at about 10:00 pm amazed that we were back in the hospital. We were in the hospital for 17 days. 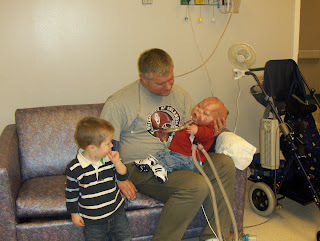 Fletcher was on the vent for 5 days (in the PICU) and 10 days on the floor requiring oxygen. For some reason we could not wean Fletcher off of the oxygen. 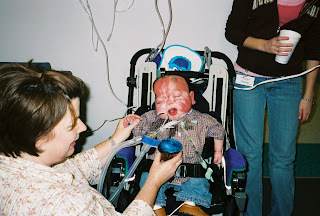 So, on June 25, 2005 we went home with some more equipment, a concentrator, portable 02, pulse ox meter and a suction machine. After being at home with a feeding pump and all that goes with it we had run out of DME (Durable Medical Equipment) meaning our insurance would not pay the $350.00 a month bill for the new equipment. The Lord was so good to us in that the VP of the home health equipment company happened to be the father of one of Craig’s childhood friends. Coincidence, I don’t think so! Anyway, he gave us the equipment for $50.00 a month. We were so grateful for this blessing that we knew only came from the Lord! Let me back up just a bit, right before we left the hospital, one of the PICU doctors, Dr. Griggs came to Fletcher’s hospital room and suggested that we place Fletcher in The Children’s Center, short term, of course. I was devastated, appalled, and offended because I thought Dr. Griggs didn’t think I couldn’t take care of my baby! Of course that wasn’t the case, I have lived in Oklahoma City all of my life and didn’t really know anything about TCC, I thought it was a place you sent babies to die and I wanted no part of it. I'm sorry I haven't updated you all for the last few days. It has been crazy around here! Tuesday evening Kayleigh's grandparents and aunt Jackie came to town for a few days. They took the girls to a hotel for two nights, swam and shopped 'til they dropped! Everyone had a great time. Tuesday I received an email from sweet friends of ours the McLaughlin's wanting to bring us Thanksgiving dinner on Thursday. 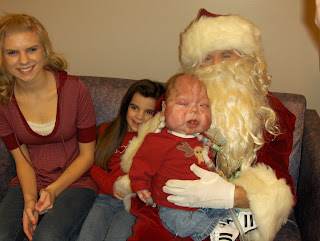 I'm sure you can imagine what a blessing that was sick kid or not! We were able to bring Fletcher home for Thanksgiving it was wonderful to have our family together in our home. We ate a fabulous meal, thanks Mike and Ryan, had a family picture made and ate some more! Earlier in the day Craig and I were in the kitchen and Kayleigh, Maddie and Fletcher were in the living room. The girls were sitting beside Fletcher's crib just hanging out with him and at one point we heard uncontrollable laughter coming from the living room. Craig and I looked at each other and were so grateful that our children were in the same room talking and laughing together. That's something we don't take for granted, what a blessing! I've posted a few pictures from yesterday. If you look closely at the first picture you'll see that Fletcher has one of Maddie's bracelets on. I guess she wanted to play dress up with her Bubba! We are so thankful to the Lord for such a great day at home with family. Maddie taking care of Bubba swinging! I know some of you are wondering about the MRI. Everything went well Monday. Dr. Griggs did a great job sedating Fletcher for the brain MRI, that they went ahead and did an echocardiogram of his heart, too. At this point we do not have any news on the results from either test. Fletcher is still a little on the grumpy side, but he's definitely feeling better. His phosphorus level is slowing going up, it is not back where it's supposed to be. I really appreciate you all praying for us it means so much knowing Godly people are lifting us up! When I arrived at TCC this morning Fletcher's heart rate was in the 160's his normal heart rate is usually 118-124. He was extremely irritable so they gave him some Morphine hoping to calm him down. I held him most of the morning and he did eventually calm down and his heart rate stayed in the 140's. 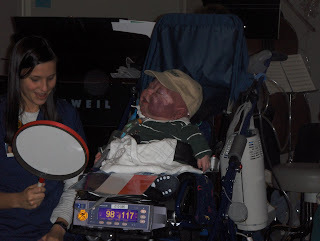 The nurse practitioner, Tami, came in this morning to access him and to check the lab work they had done. She felt like he was responding well to the IV medication and that he was stable. I was able to spend the most of the day with Fletcher. There wasn't a whole lot that would make him happy and I only saw a few smiles today. He went through many stages of wanting to be held and wanting to be left alone. He seemed very restless and had a hard time getting comfortable. Poor thing! I'm hoping he'll still be able to have the MRI on Monday, but we'll have to wait and see. We are also wanting to bring Fletcher home for Thanksgiving. Please keep him in your prayers. That's it for now. Thank you so much for all your prayers today! Fletcher is still in need of your prayers. Yesterday afternoon we found out that he is having Congestive Heart Failure. His heart is enlarged and we think it could be because of his critically low phosphorus level. We also found out that he is ALWAYS at risk for CHF because of his past heart problems, his pulmonary hypertension and because he is ventilator dependant. At this moment he is still at TCC and they are monitoring him closely. They are keeping in touch with a PICU doctor at Baptist in order to know how best to treat Fletcher at this time. 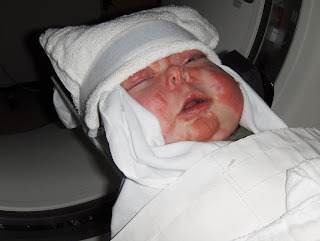 TCC promised us that they would send Fletcher to the hospital when and if he needed to go. Craig and I are really worried and are asking you to please lift Fletcher up in prayer today. I'm sure we will be spending most of the day at TCC, Craig's mom, Trudie will have the girls and keep them busy today. Thank you for remembering us in your prayers today. I'll keep you posted. Just wanted to let everyone know that Fletcher is going in today (Nov 12, 2007) for surgery. 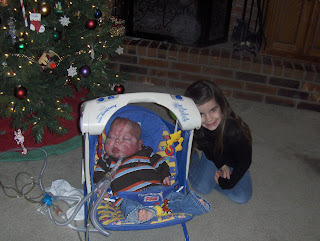 As you may already know, his central line came out last week and so he will be getting a new one - or something similar. He will be leaving the Children's Center at 11:00 AM but there is no set time scheduled for the surgery. We would appreciate your prayers during this time. Just a quick update on Fletcher. When I walked into Fletcher's unit this morning he was surrounded by a couple of nurses, an RT and several student nurses. Not good. I rushed over to his bed and he was a frightful shade of purple and they were bagging him. Well, every time we would try to put him back on the vent he would desat again! This happened about three times. We finally figured out that his vent was disconnected and he was better. I had a meeting to go to so I left for about an hour and a half. When I got back to his unit there was another gang of people around his bed including an x-ray technician! Again, not good! I bet we bagged him about 10 times today. A few posts back I mentioned that Fletcher had a yeast infection and it STILL is not cleared up and seems to be traveling all over his body. One of the biggest concerns is that it will get into his central line (a line in his chest in order to give him IV medication) it could be very bad if the line were to get infected. And they really aren't sure that it's yeast, it could be impetigo, but like I said we're not sure. I was given quite a bit of information today and to be honest I'm not sure I completely understand what's happening. I do know an infected central line is bad and they would have to surgically remove it and if there is any sign of infection the surgeon won't put another line in. Not good, because Fletcher NEEDS a central line for emergency meds. They also told me that if he has a fungal infection internally that it's very hard for someone like Fletcher, who has a suppressed immune system, to fight off. He would require an IV anti-fungal and they have TERRIBLE side effects, like damage to your internal organs and hearing loss, just to name a few. They were able to culture a few of the infected areas and did some blood work. It will take 48 hours to tell if it is a bacterial infection and it will take two weeks to see if it's a fungal infection. So, right now they are giving him IV Vancomiacin and Rocephin. So, if we can hope for something we're hoping for a bacterial infection as opposed to a fungal infection. But, I know we can PRAY that there is NO infection at all! Would you all please agree with us in prayer that there will be no infection? Well, it's been a long day and I need some rest. Talk to you soon. 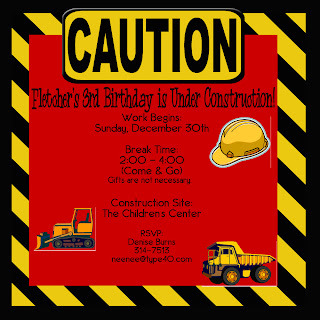 EDIT**** WE JUST GOT A CALL FROM TCC AND FLETCHER'S CENTRAL LINE CAME OUT. THEY FOUND IT LAYING IN HIS BED. THEY HAVE STARTED A PERIPHERAL LINE IN ORDER TO GIVE HIM HIS IV MEDS. THAT'S ALL I KNOW FOR NOW! Every Wednesday morning I attend a precious Mom's Bible study at my church. Maddie spends Wednesday afternoons with her friends Max and Zeke. While Maddie is hanging out with her friends I use that time to spend with Fletcher. He's been having some problems with his left eye and as the nurse practitioner, Julie was looking at it I asked her to look at a bump on the top of Fletcher's head. She felt the bump and was very suspicious of it. She called Dr. Khichi (Fletcher's PCP) and he told her to order an MRI. 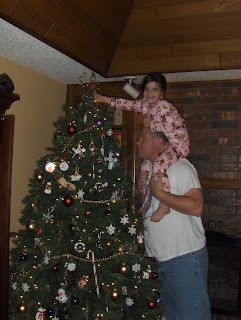 Well, Julie wasn't convinced that this was the best way to go so she called a pediatric neurologist. 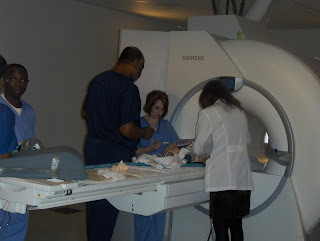 The two of them decided Fletcher needed to have an emergency CT scan. They wanted to rule out water on his brain or a brain bleed. Needless to say, I was becoming more afraid with every bit of information I was receiving. I called Craig and he came up to the Center. Children's Hospital said they could do the CT scan if we got there immediately. That meant Craig and I would have to drive him there in our van. Normally this would be a problem because I don't keep Fletcher's car seat in our car, but remember last week when Fletcher was supposed to go to church with us? Well, I hadn't taken the car seat out of my van so it was in there and we were set to go. Thank you, Jesus! Well, we had a CT scan at Children's at the end of June and it was a fiasco! So, Julie went with us to make sure everything went well. I'm so thankful she went because although it took about 2 hours of waiting we didn't have too many problems. They had to do the scan two different times because the first one didn't get good pictures. In an attempt to keep Fletcher calm, Craig and I stood on either side of him and sang at least ten rounds of 'Old MacDonald'. Anyway, they were able to rule out the water on the brain and the brain bleed, but Fletcher is still going to have to have a MRI, hopefully very soon. The person reading the CT said the bump looked like a spongy bone and that it was about an inch and a half deep. That's weird. We're not completely sure we understand what a spongy bone is and how it would pop up in a day. So, we're thankful that he will have a MRI. The first picture I posted is from yesterday, if you look closely you can see a slight bump where his soft spot was. The others are from the second CT scan. Yesterday at the eye doctor What a trooper, that's a smile on his face! Oh yeah, and he's supposed to be sedated! Again, he's supposed to be out like a light! Sweetest daddy in the world! Fletcher is back at the Center and is resting well. Craig and I are so thankful to the Lord for this turning out not to be a nightmare. We are grateful for Julie being so aggressive and proactive today. We feel so much better knowing that Fletcher is being taken care of by such wonderful people. We would of course, appreciate your prayers. One, that we could find out what this bump is, two, that we would be able to get an MRI very soon, and three, for the doctors and nurses dealing with Fletcher will have wisdom and discernment. I thought I’d start with Fletcher’s story at the beginning. Physically my pregnancy with Fletcher went well, unlike Maddie’s. I had high blood pressure and Maddie had to be delivered by emergency c-section. Emotionally, my pregnancy with Fletcher was filled with moments of fear. 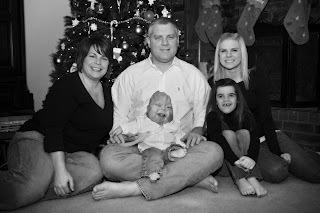 I spent a lot of time worrying that Fletcher might have Down Syndrome, or that he had a form of dwarfism. I basically borrowed a lot of trouble. Now, you need to realize we didn’t know there was anything wrong with Fletcher until the day he was born. We had such plans for adding this little guy to our family! Fletcher would be the only grandson on Craig’s side of the family. So, we did know one thing, he’d be spoiled rotten! We live in a small 3 bedroom house and the plan was to move Kayleigh into the smaller bedroom and let Maddie and Fletcher share a room. Every time I have decorated my kid’s rooms I paint one of their favorite scriptures on the wall. Kayleigh’s room is now pink and brown and 1 Corinthians 13:13 is on her wall. I painted Maddie and Fletcher’s room yellow, purchased semi coordinating bedding and began to look for the perfect scripture for their walls. I decided on Joshua 1:9 ‘Be strong and courageous, do not be terrified for the Lord your God is with you wherever you go’ I thought that was such a tough scripture and would be perfect for my tough little boy. I remember a morning that I was experiencing one of my moments of fear. I was getting ready for the day and I was panicking about my unborn Fletcher and the Lord brought Joshua 1:9 to my mind. And I felt like He was telling ME that that scripture wasn’t just a tough scripture to paint on a wall and that I was the one in need of some courage. I still haven’t finished M&F’s room. I have tried but it just doesn’t seem right to prepare a room for him when he’s not here. That’s a whole different story for a whole different day! 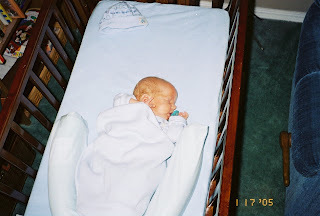 On December 30, 2004 at 8:12 am Fletcher Samuel Burns was born via scheduled c-section. 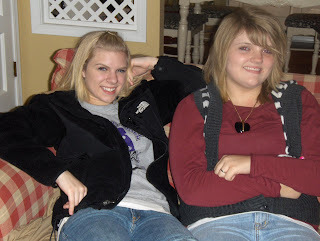 I remember being so emotional that morning, crying before we left to go to the hospital. 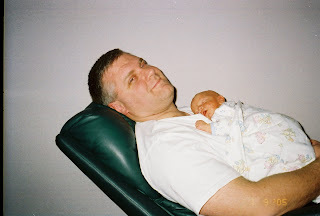 When they were getting me ready for the c-section I couldn’t look at Craig without crying. He was waiting outside the operating room door as they were preparing me and every time he looked at me I would cry uncontrollably. I was a basket case! I just wanted Fletcher to get out my tummy so I could hold him! Well, that didn’t happen. Instead after Dr. Hager delivered Fletcher the nurses took him over to the corner of the room to get cleaned up. 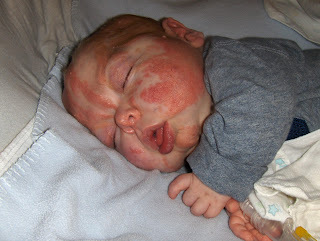 I only saw a glimpse of Fletcher and I could tell something wasn’t right with his skin. 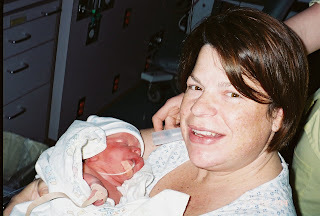 And the next thing we knew the NICU doctor was in the OR and she took Fletcher to the NICU. 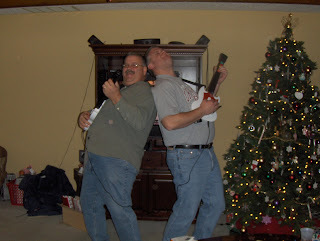 It seemed as though no one knew what was going on especially Craig and me! As they were putting me back together sweet Dr. Hager told us that Fletcher had some kind of rash and that they would do some lab work and try to figure out what was wrong. I did not see or hold him until an agonizing eight hours later. 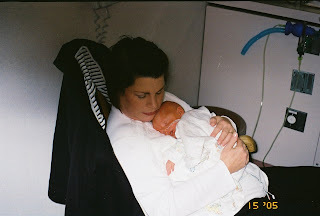 Since I had a c-section I had to recover for eight hours before I could go upstairs to see him. Someone brought me a Polaroid picture of Fletcher so I could ‘see’ him. I must have looked at that picture a thousand times. Craig and I knew in our hearts it wasn’t a rash covering his sweet little face. But each day we were in the hospital family and friends would say, ‘that rash is clearing up’ or ‘his rash looks better today’. Thankfully we had already prepared ourselves for the worst. That is pretty funny to think about NOW, that a so-called rash could be the worst possible thing wrong! 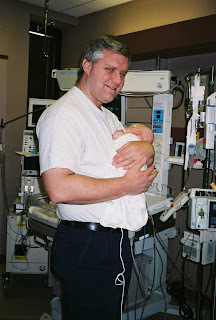 After my eight hours of recovery Craig wheeled me up to the NICU to see my sweet boy. I wasn’t prepared for what I saw. Craig was so thoughtful and tried to explain everything to me. Fletcher was requiring oxygen so they had this clear plastic box over his little face. He had a tube in his mouth and he was hooked up to all kinds of monitors. I was able to hold him, but I was so afraid. I was afraid I wasn’t going to be able to bond with him. Afraid I’d hurt him. Afraid of all the wires and tubes. Afraid for his future and people being mean to him because he looked different. I was a mess. Well, I went home after four days in the hospital Fletcher did not. I will never forget coming home and seeing the “Welcome home Mommy and Fletcher” sign Kayleigh and Maddie had made. It was almost unbearable to walk in the door without my baby. I tried to be brave for the girls but it was too much. I told everyone I was tired and I went to my room and just cried. It was awful. I did not know how to do this. I hadn’t thought beyond the moment. I think I must have been in shock. Somehow Craig knew what to do. 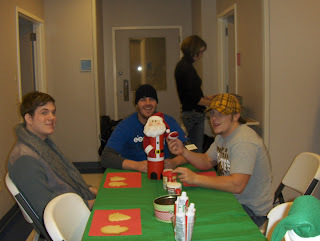 So someone took me to the hospital each day and dropped me off so I could be with Fletcher and each night after he got off work Craig came to the hospital. Unbeknownst to us, this was the beginning of what we now call our life. 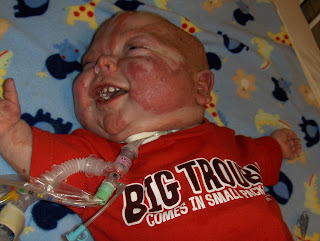 Fletcher was in the NICU for 19 days. He was there because no one knew what was up with his skin, his right eye would not open completely and on top of all that he would not eat. The doctors would not let us take Fletcher home until he could take 45 cc’s of formula consistently. That’s only an ounce and a half! It was sheer torture making him take a bottle. We had to work with a speech pathologist to learn techniques of how to HOLD his bottle so he would take the required amount. It was crazy to us. We had just entered a whole new world and we were clueless. We thought if we could just get him home, he’d eat. Not so my friends. Poor little Fletcher was miserable. He cried constantly and he wasn’t really big on sleeping either. Craig and I were beside ourselves. We did not know what to do with this baby who didn’t eat or sleep and cried all the time. But somehow the more he needed me the more I loved him. Fletcher's first night at home. No tubes or wires! The last two days have been tough for our sweet Fletcher. 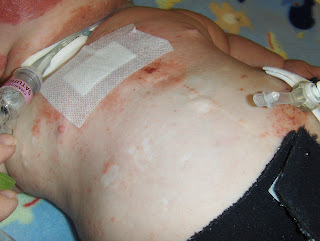 He has a very bad yeast infection around his trach and g-tube, on his tummy, under his left armpit and in his groin! UGH! 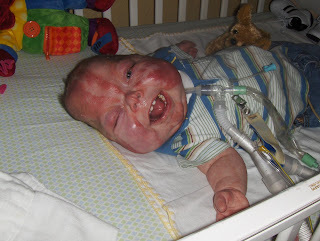 Our concern is that the infection will get to his central line and that would be bad news! But, so far they have been able to keep it at bay. Right now they are treating it with Difulcan and a topical cream, they'll try this for 48 hours and if it doesn't clear up they will give him an IV anti-fungal. He's just been cranky and I don't blame him! Last night our church had Holy Halloween, the plan was to load up Fletcher and take him to the church. Well, that plan fell through when we went to TCC to get him ready and he just wasn't happy and nothing we said or did changed his attitude. Then as soon as we put him in his wheelchair he desated. That's when I said forget about it, he's not going anywhere. 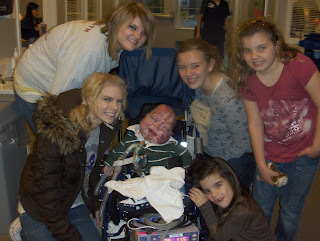 The girls were already at the church so Craig stayed with Bubba and I went to meet the girls. I was so sad not to have Fletcher with me. I'm so tired of not having a normal family where we can all go places together. And I hate that that's our normal. People don't ask where Fletcher is, because it's normal for him not to be with us. I know, having this kind of attitude doesn't help and you all know I don't dwell on this constantly but some days are just harder than others. And yesterday was one of those days! The girls had a great time. 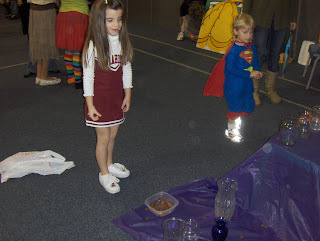 Maddie played all the games and bounced the night away in an inflatable! Kayleigh helped her youth group sell nachos and throw people in 'jail'! After Holy Halloween, Kayleigh had a blast trick or treating with her cousin. Well, that's all for now, please keep Fletcher in your prayers that this yeast infection would go away and that he'll stay healthy this winter.